In August 2018, the New York Public Service Commission approved a petition by Consolidated Edison Company of New York, Inc. (Con Edison) for a $5 million, three-year natural gas demand response pilot program, one of the first demand response projects for natural gas. Demand response (DR) programs help manage utility usage during periods of peak demand. These programs have become fairly common in the electricity sector during the past 10 to 15 years. 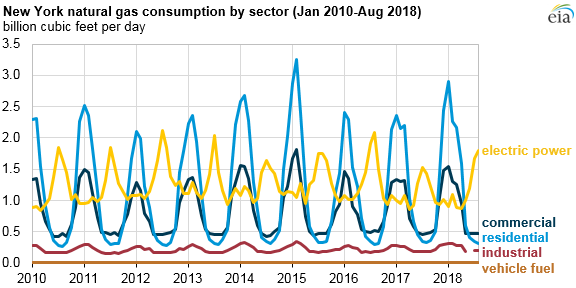 For the electric power sector in the United States, peak electricity demand occurs in the summer, when warm weather increases the demand for air conditioning. Conversely, peak demand for U.S. natural gas occurs in the winter. Natural gas is used directly to heat homes and buildings and as a fuel for electricity generation. Nearly 60% of New York homes used natural gas as their primary heating fuel in 2017, based on data from the U.S. Census Bureau’s American Community Survey. Con Edison has firm pipeline transport contracts that enabled the company to meet 83% of its peak-day demand in the winter of 2017–2018. Firm contracts provide Con Edison with an agreed-upon supply of natural gas that cannot be curtailed except under unforeseeable circumstances. To meet the rest of its peak-day natural gas demand, Con Edison purchases delivered services (also known as peaking contracts) from other companies. Unlike firm transport contracts, which generally have renewal rights, delivered services are not guaranteed to be available in any given year, especially if competing natural gas use elsewhere continues to increase. According to Con Edison, firm natural gas demand on its peak day increased by more than 30% between 2011 and 2017, and it expects the peak to grow by an additional 23% during the next 20 years. The increasing peak is driven by a preference for natural gas heat in new buildings and the switch from heating oil to natural gas in existing facilities. This transition is a result of both a 2011 mandate to reduce the use of heavy heating oil (No. 6 fuel oil) in New York City and the general decline in natural gas prices since 2011. Con Edison estimates that, by the winter of 2023–2024, its firm pipeline contracts will meet only 78% of its peak-day demand absent any new pipeline capacity. However, no remaining firm pipeline capacity is currently available into New York City or Westchester County, and recent attempts to add pipeline capacity have stalled as a result of regulatory challenges. Con Edison is now planning alternative measures, including DR, to reduce reliance on interruptible contracts and to help ensure all its customers are served on the coldest days of the year. In its pilot program, Con Edison proposed two methods of natural gas DR that closely match its existing electricity DR programs. For residential and small commercial customers, it proposed using direct load control to adjust customers’ thermostats during peak natural gas demand days, with financial incentives for participation offered for up to 1,000 customers through 2021. For industrial, large commercial, and multi-family residential customers with centralized boilers, Con Edison proposed to achieve demand reductions through financial incentives alone when peak demand days are forecast. The company aims to enroll 500 new customers each year in this portion of the pilot program. Although DR has become fairly common in the electricity sector, programs to reduce natural gas demand have only recently been adopted. In early 2017, Southern California Gas Company (SoCalGas) piloted the Seasonal Savings program, which used direct load control to adjust about 50,000 residential thermostats according to a household’s schedule and preferences to reduce short-term peak demand. In the winter of 2017–2018, 16 National Grid customers in New York City and Long Island participated in a DR program aimed at commercial and industrial customers, where large heaters or machinery running on natural gas were turned on and off to manage peak demand days.